Bro is an open-source highly-stateful network analysis framework. Although it’s mainly focused on network security monitoring, it provides a platform for general network traffic analysis as well. Bro is the monitoring backbone for many universities, research labs and supercomputing data-centers around the world. It is developed by Vern Paxson along with a team of researchers at the International Computer Science Institute in Berkeley and the National Center for Supercomputing Applications in Urbana-Champaign. Today we are going to show you how to install Bro on an Ubuntu 16.04 VPS. Bro should be installed in the ‘/usr/local/bro’ directory now. Make sure that the ‘interface’ setting is set to the public interface on your server. Restart the session by logging out and logging in to the server again. That’s it now you should have successfully installed and configured Bro on your Ubuntu 16.04 server. 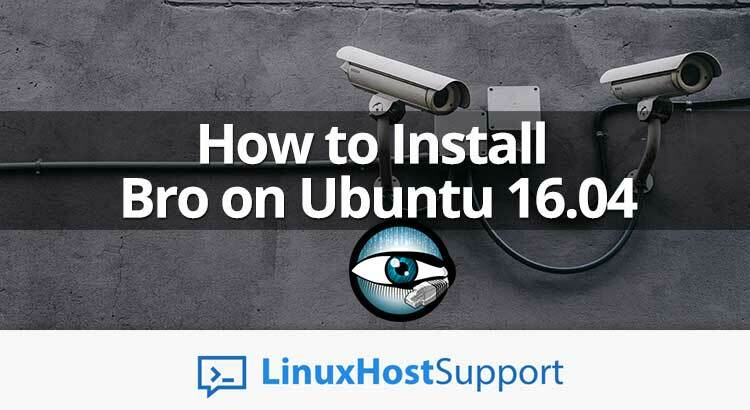 Of course you don’t have to Install Bro on your Ubuntu 16.04 server, if you use one of our Linux server support services, in which case you can simply ask our expert Linux admins to setup this for you. They are available 24×7 and will take care of your request immediately. PS. If you liked this post, on How To Install Bro on Ubuntu 16.04, please share it with your friends on the social networks using the buttons on the left or simply leave a reply below. Thanks. i am unable to login after completing the Installation????? Did you check the log files?